Fran's grandfather was a founder member of the Wroughton Sliver Band and was still an active member when Fran's father joined the band, eventually holding the position of Principal Cornet. As a young boy, Fran was given the opportunity to play the cornet, and, following in his father's and grandfather's footsteps, he joined the band. After a short while with the Wroughton Silver Band, he moved to the then Great Western Railway Social, Education and Union Association Band, whose name has changed over the years to Swindon Rail Staff Association Band to John Holmes Swindon Concert Brass to Swindon Concert Brass and is currently known as Swindon Pegasus Brass. Fran left the band for a short while in 1945 when he was conscripted into the Army. During this time, he continued his musical interest and was Principal Cornet for his Regimental Band (The Wiltshire Regiment). Apart from an enthusiasm for Brass Bands, Fran was, and still is, a very keen Dance Band trumpet player, again, playing for his Regimental Dance Band whilst in the Army and eventually assisted in founding the Swindon Big Band for which he still plays Lead Trumpet. Fran is also a very experienced Solo Cornetist, competing locally and nationally, at one point in his playing career was fourth best Solo Cornet player in the Country and undefeated Champion Solo cornetist of Wessex. On completion of his Army service, Fran rejoined the Great Western Railway S.E. and U. Band as Principal Cornet and Bandmaster, playing an important part in the development of the Band. In 1966, Fran was insrumental in founding a Club for young musicians in the Swindon area (Swindon Instrumental Music Club, currently known as Swindon Young Musicians). Fran has helped the Club grow from a mere handful of string, woodwind and brass players, into an organisation with a membership of over 800 persons, mainly of school age or under. In 1974, Fran founded the Swindon Young Musicians Youth Brass Band and has been their Musical Director ever since, whilst continuing to play Principal Cornet for the Swindon British Rail Staff Association Band and Lead Trumpet with the Swindon Big Band. In 1982, Fran extended the Youth Brass Band so that older members could continue to play and started contesting a Fourth Section Band (still known as the S.Y.M. Youth Brass Band), which was successful at a local competitive level. After thirty three years as Principal Cornet with the (by now) Swindon Concert Brass, and playing under Joe Alder, Roly Mundy, Cyril Winstone, George Snook, Barbara Stone and Denzil Stephens, Fran took over as Musical Director in 1983, following the retirement of the the M.D. Courtney Bosanko M.B.E. As a Conductor with both Swindon Concert (Pegasus) Brass and the Youth Brass Band, Fran has been very successful. 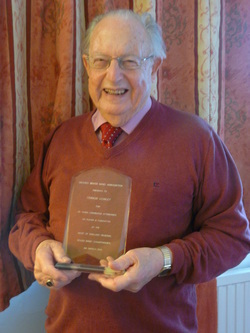 Within his first eighteen months with Swindon Concert Brass, he had taken the Band through twelve contests, eleven of which saw the Band in the winning frame. Fran's successes with the Youth Brass Band run into a small catalogue including winning the West of England Youth Brass Band Champions title in 1977, 1984, 1985 and 1991. In 1993, he led them to success in the West of England Open Youth Brass Band Championships. As a result of these successes, Fran has had the privilege of conducting the Youth Brass Band in such locations as the Royal Albert Hall when they participated in the National Brass Band Championships of Great Britain. Fran also took the Youth Band to Fairfield Hall, Croydon and Festival Halls, London on a number of occasions, participating in the annual National Festival of Music for Youth where they were often highly commended and received awards for their performances. During his years as Principal Cornet with the Swindon British Rail Staff Association Band, Fran had the privilege of playing at the Royal Albert Hall in the National Brass Band Championships of Great Britain (Championship Section) under Barbara Stone in 1973. Fran continued in the post of Musical Director to Swindon Pegasus Brass until October 1991, where, after more than fifty years loyal srvice to them, he terminated his membership, feeling that he could channel his efforts with more effectiveness, elsewhere. It was this move that saw the birth of Swindon Band (S.Y.M. ), as a Fourth Section Band, which evolved into our band, Swindon Brass.